We recently remodeled a very small L shaped bathroom. The room used to have a 3′x3′ window, which let in light but offered very little privacy. The first thing I wanted to change was that window. Since the room is small and has little wall space for pictures or decoration; I felt a stained glass window would be the best option. It would add interest, let in necessary light, and offer the privacy needed. Not wanting to do major reworking of the window’s header, I stayed to the existing measurement of the window opening. I was able to find a beautiful antique 3′ x 1′ transom window, with original frame, on ebay that was in my price range. I made a casing for around the window, attached exterior trim to it making it one unit, ready to slide into place from the outside of house. Primer and prepaint the window trim make installation quick and easy so all you have to do is touch up paint at nail heads. Exterior wall widths can very. My house was built with 2″ x 4″s yours may be 2″ x 6″. 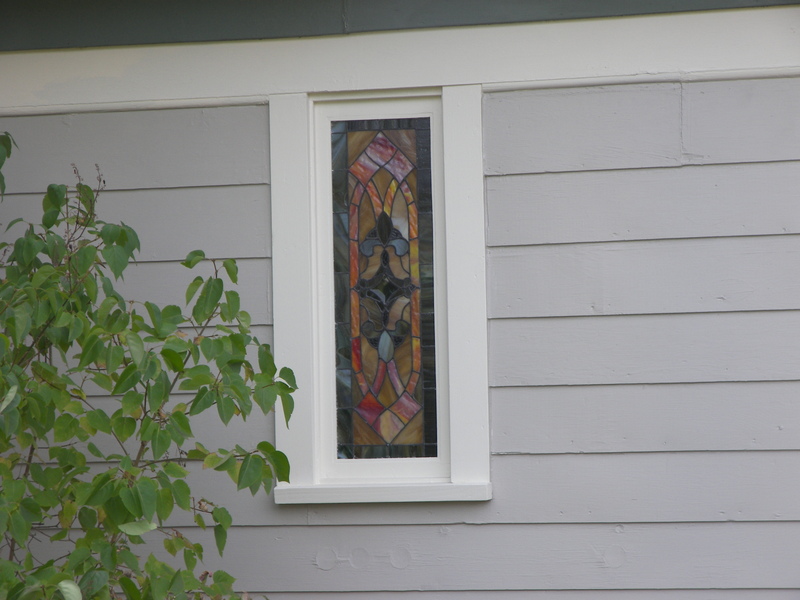 To frame in the window, simply cut a 2″ x 4″ (or 2″ x 6′ which ever is called for) the height of the window opening . Measure from the side of opening, adding the width of window casing plus about1-2 inchs and mark with pencil. Insert 2″ x 4″ into opening at mark. Toenail it into place. Then fill in the subsiding of the house to match the thickness of the existing subsiding. Always make sure to cover the subsiding with moisture barrier to help keep moisture out. Sliding the window into place, leveled it with shims. The trim work, already attached to window casing is now nailed into the subsiding. This is what actually holds the window in place. 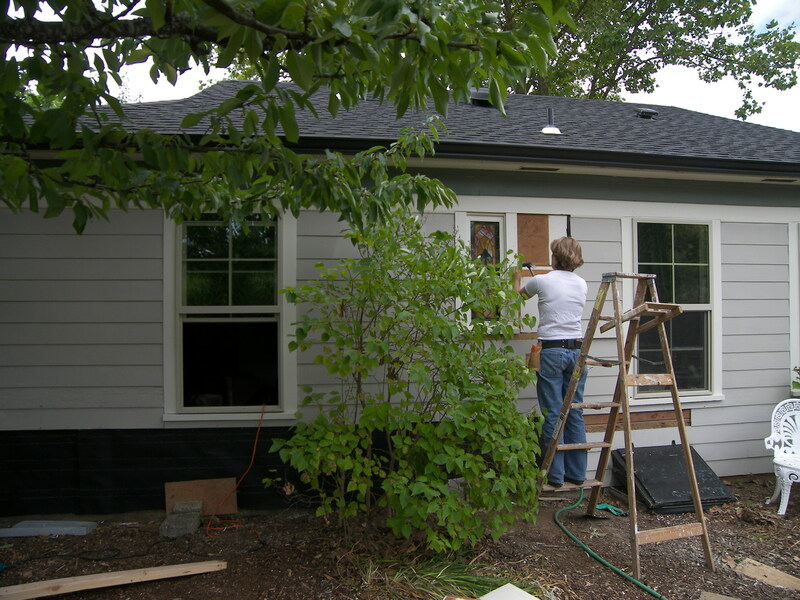 Replace the siding pieces and place them accordingly. Make sure to counter sink all nail heads in window trim then caulk all holes and seams. Let caulking dry for the amount of time suggested on the tube. Finish up with the primer and paint. The results are beautiful! A small investment, with huge returns in uniqueness and personality. Just remember that bathrooms need proper ventilation. If you install a none opening window, make sure you have a well functioning ventilation fan. If you don’t have a fan, you can buy a light/fan kit that is easily installed at existing ceiling light opening. These kits can be found at your local building supply store. Install according to manufacturers instructions.